As part of Proton’s business expansion plan, the national automaker is looking to increase the number of 3S/4S centres to 109 in preparation for the launch of its first-ever SUV model in Q4 2018. Over the past three months, the company has received 170 applications from dealers or potential business partners looking to set up 3S/4S centres, with 82 of them, potentially approved for the upgrading exercise. Up until now, 66 applications have been duly evaluated and approved, accounting for 61% of the 109-centre quota Proton has set. With this in mind, the automaker is confident to achieve its target for the dealers network upgrade exercise for 2018. Looking forward, the company is set to introduce more models to be co-developed with Geely, and will continue executing its upgrade plan which consists of different phases until 2020. 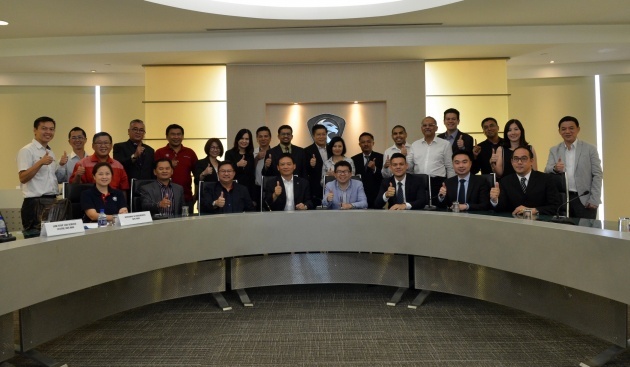 Beyond upgrading its dealer network, Proton has also worked on improving its internal processes. This includes hiring experienced members of the automotive industry and sending its workforce to learn from its partner in China. The automaker also focused on improving the overall quality of its products by adopting Geely’s product quality audit scoring system, itself an adaptation of the system used by Volvo Cars. These efforts are just a few that are being done in anticipation of Proton’s upcoming SUV model, which will come with features like adaptive cruise control and an autonomous emergency braking system. Camouflaged units have also been displayed at various areas for the public to view, and there’s a well-received online naming survey as well. To boost car sales by Proton dealers and good biz, Vehicle End of Life policy must be rolled out ASAP. blah bla bla,, y taking so long to rebadge an suv.. ooo wai! Just because of Boyue…have to upgrade service centres. By right,Protong should dismantle all existing local vendors(no point telling them to cut prices by 30%,cos they curi ayam,anyway),upgrade all centres,throw away the campro engines with Punch CVT gearboxes…u can see the fence sitters come back to buy Protongs. Does it take another 30 donkey years to realise what the rakyat want? This year 2018,without Boyue,P1 can only touch 50,000 unit sales. Converting LHD to RHD, even Tesla needs 2 years to do it! You can have all the fancy $S showrooms in the world. You can even put a GSC Cinema or TGV cinema in your showroom to show free movies. You can serve the best latte in town. But all this have no meaning when you price your product at RM100k. Who in Malaysia can really afford RM100k? As Proton CEO already announced, 75% of their total sales come from Saga and Persona. Cars that are RM50k. The balance 25%, you can assume, bulk percentage comes from Government ordered Perdanas. So at the end of the day, PRICE rules. All the posh showrooms have no meaning when you gonna sell your car at RM100k. we’ve seen this trick or the trade before: Keep teasing ~RM100K price tag and all those features; but in reality the ~RM100K price tag will likely be for a base (kosong) model and you’ll need to pay way more than that to have access to all the fancy bits they keep talking about. Already time to ditch SUV craze. So late to market la Proton. If only for Malaysian market, this car for sure will be expensive and won’t turn around the company. If can’t tap into Indonesia, don’t bother be in business la. above 2 things all easy to do why need to wait long? 1st, They need to learn how to use Google Translate. Which isn’t very accurate (for technical documentation) nor grammatically correct & neither is Baidu Translate. 2. loool.. u know china is left-hand drive rite? You think snap finger only can convert left-hand drive car to right-hand drive? You kan cheong (eager) to buy ah? Sometimes I wonder if Malaysians even think before commenting. If you don’t know, read up so you don’t end up looking like an idiot. There are a host of things that needs to be re-designed, re-moulded and re-tested to make a LHD vehicle a RHD one. It isn’t as simple as you think. The cost can be upwards of RM100m (which is 1/8th the cost of designing a car from the ground up excluding the engine). I would really rather PROTON get it right instead of rushing through the conversion. Please take your sweet time and be properly prepared. Dont give us half-cooked product and services after your much hyped take over. Geli-Geli is a good name for the re-badge SUV ..
To start with, i’m a Pakatan man all the way, let’s get that out of the way. When Proton started with these sales of share, i was a bit sceptical, but now i realize, a government can’t run a business, there is too much invisible hand. Yes, we rebadge car now, but what is wrong with that, it is a business and as long as proton is making money & not depending on gov coffer year after year, I’m down with that, it should have been done long ago… good luck proton on your future endeavour. You are having diarrhea but you wash the toilet and hope that the diarrhea will go away. Proton is only good for Brim recipient category. Anyone with the right mind that can afford RM70-80K car would not buy a Proton. Good analysis. One more point, IF …. a big IF, Perodua launches it’s SUV before Boyue, it would grab some potential buyers away. The potential buyers of Boyue would most probably be those who are looking for C segment SUV but are price conscious. Hence either upgrade from existing P1 owners (but only those Exora/Suprima/Preve/Inspira), those who don’t wish to buy the Accordana or those driving other brands older C segment sedans and are looking for value for money C segment SUV. Granted definition of “value for money” is different from 1 person to the next. OMG…I agreed, if the selling price for this car more than 100K, it will not sell well. Excellent. Keep up the good work! Malaysians, ASEANs and the world will soon know the might of Geely empire! wow, Geely already starts market Lotus in TVB drama!! Very clever product placement exercise. Proton geli.. who wanna buy proton at rm100k? Btw, what do they mean “History is calling”. 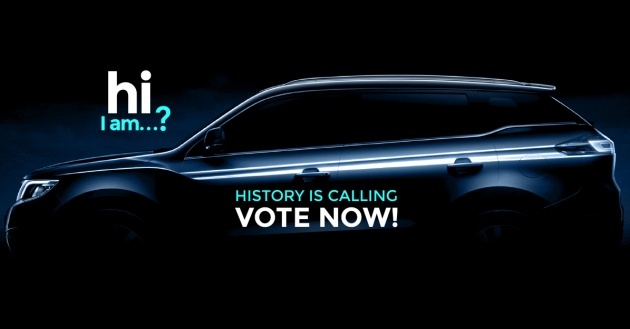 Are they implying that this model is gonna create history? China rebadged SUV is history? Really? Q4? Too long. Save our money to buy perodua suv..
Komen org2 banggang banyak kat sini….sapa2 nak baca silakan…. Previous Post: MPV Geely VF11 – imej bocor sebelum didedahkan, bakal dijadikan asas untuk Proton Exora baharu?